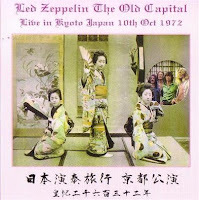 The final show of Led Zeppelin's final tour of Japan begins with a brief soundcheck before Rock and Roll crashes into motion. Page's fingers get a bit stuck in the strings during the guitar solo in Black Dog. A high-speed Misty Mountain Hop is introduced as "one about Japanese grass." Page is on fire during an excellent Since I've Been Loving You, played at a hurried pace. A lightning-fast The Song Remains the Same is again introduced as "The Campaign." The Rain Song is beautiful. Plant asks "what's the time?" adding "we got an hour..." off-mic before the shortest Dazed and Confused since 3/5/1971. Page blazes through the bare-bones guitar solo/workout section. As the song ends, Plant says "to the man who's sleeping in the front row, will you please stand up!" In an unusual setlist change, Over the Hills and Far Away is played after Stairway to Heaven. Whole Lotta Love includes a frantic new intro. The Everybody Needs Somebody to Love section is an explosion of raw energy. The medley includes Boogie Chillen', That's All Right, a frenzied rendition of Brenda Lee's Let's Jump the Broomstick, and Goin' Down Slow, which includes a wild blues improvisation. The show ends with a quick Immigrant Song. An excellent compact finale to a rather lackluster tour. The tape is fairly clear, if a bit noisy.